Somewhere in Heaven or on Mt. Olympus or wherever divine beings congregate, the Food Gods and the Irony Gods are toasting and laughing at me. Because, as I write these very words, I am eating quinoa. They (those gods) had barely just gotten over their amusement at my new jogging regimen (after years of declaring that I only ran if something was chasing me), and now they had this to entertain them! As I set out in the manifesto when I first launched this blog: “I have serious reservations about quinoa. It’s the didgeridoo of grains. (Anyone who has seen a 40-year-old white guy playing a didgeridoo at a farmer’s market will understand what I mean…)” In the narrative and mythology of Skinny Girls & Mayonnaise, quinoa was the Incan Voldemort to my porky gourmand Harry Potter. My friends (Gregg, I’m looking at you!) even forwarded me articles on the quirkier aspects of the quinoa faithful. But all that was before the diagnosis of pre-hypertension and the doctor with her medication prescription. Now here I was, in the Trader Joe’s grain section, glancing about to make sure no one I knew was watching, considering which quinoa to purchase — red, white or a combination of the two. Even worse, here I was with a plate of the stuff sitting before me for lunch. Short of tossing it with duck fat or frying it in bacon grease — which would defeat the purpose of eating it in the first place — I did my best to doctor it up (read: disguise it) with roasted pumpkin, toasted walnuts, rice wine vinegar, lots of olive oil and even a Greekish cucumber salad on top. Skeptically even despite my confidence in my own cooking skills, I dug in. And you know what? It wasn’t bad! I know some of you out there, my friends, have doctors of your own chasing after you with medication — for blood pressure, cholesterol, etc. I’m not against medication entirely. But before you give in to it, you might consider getting the heart rate up and eating stuff like this, maybe just at least during the day (like Marc Bittman). I did, and I survived. Toss the pumpkin with 1/4 cup olive oil. Place on a small baking sheet or a piece of foil, and cook in a 400-degree oven for 45 minutes to 1 hour, until soft and caramelizing on the edges. Remove and let cool. Make the cucumber salad: In a medium bowl, toss the cucumber slices, garlic, 1/4 cup olive oil and nonfat yogurt until combined. Set aside. Compose salad: Place 1/2 cup of arugula on each plate. Top with 1/2 cup of quinoa. 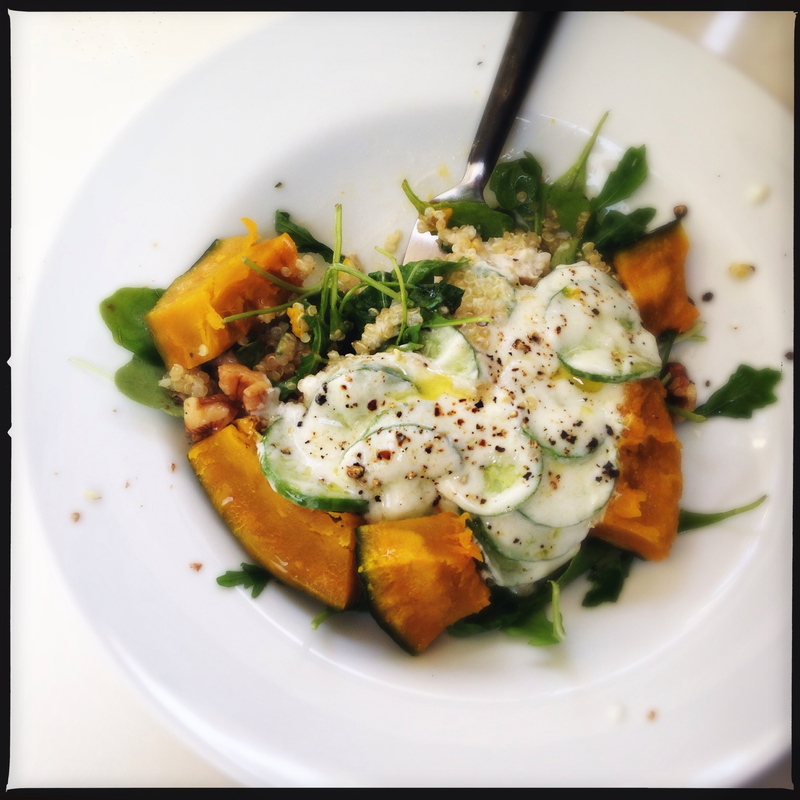 Arrange pumpkin chunks around the quinoa. Sprinkle toasted walnuts around the salad, and drizzle each with equal parts olive oil and rice wine vinegar. Top each with a heaping tablespoon of cucumber salad, season to taste with salt and pepper, and serve. I laughed like a drain at your parenthetical question re white guys playing didgeridoos at markets! Now listen! – on a different topic … Could you NOT have ingredients like ‘rice wine vinegar’, ‘kabocha pumpkin’ or ‘persian cucumbers’? PLEASE? Just think how happy you’d make this old fart in her Pyrmont flat if you listed vinegar, pumpkin and cucmber! – it’d bring tears to yore li’l eyes, the sheer joy of it! Oh sure, I can make it even easier than that — grain, vinegar, vegetable., heat! Sighh … I don’t mean to sound like a halfwit. It’s just that whenever I see a recipe that appeals to me (I’m vego – not vegan but) it contains ingredients that I’m never going to find locally. Sorry to whinge. It’s just that I have no car, and thus neither transport nor the means of porting goods. Or maybe I’ll just go down to the beach with my pumpkin and a big slingshot — I’ve only gotta clear 7,500 miles or so of Pacific Ocean. It’s not the worst thing I’ve ever eaten. It’s more all the yoga weirdness that goes with it. LOL. I think they only do that if you’re a cop and you die chasing someone. God, that is soooo weird. I love quinoa. I didn’t know you thought it was so weird, dude. Is your blood pressure going down? Hysterical. Quinoa is just a blank canvas. It’s not really that good or bad. Just depends on what it’s served as. Every try cold farro salads? I really like those. Maybe you could try adding some mayonnaise to it next time! Careful! He’s a soldier, he might have a gun. Pshh, I was in the Marine Corps; Army is weak sauce 😉 But he loved it! Haha! Once a Marine, always a Marine. But otherwise, I got out in 2012. Did you once kill a man with your hands?? Quinoa is a perfectly tasty grain! Serves the same funtion as cous-cous or wheat bulgur, so what’s the big deal? It’s all what you add to it. Black beans, diced tomatoes, red onion, bell peppers and feta cheese with a lemon-extra virgin olive oil dressing make a delicious salad when mixed with the quinoa. It’s NOT just a grain in Los Angeles. It’s a cult. Ahhh so that’s where the Gods are. We have been asking them to prevent Wolf from burning the house down and keep Laura alive and they’re busy amusing themselves with you. Different gods — the Food and Irony Gods don’t deal w/ stuff like that. You’ve gotta track down the Injustice and Callousness Gods. Hilarious! I personally love quinoa but my husband always acts like I’m trying to poison him when I say I’m cooking it for dinner… that said, he did eventually join the tofu eating brigade so maybe there’s hope left for quinoa 😉 The recipe looks delicious, thanks! I agree with your husband!!! Tell him to watch out for any large new insurance policies on his life. Medicinal Quinoa . . . that’s legal right? Medi-physical Quinoa . . . ah yes I can see it now! Umm, Scott, that salad looks light on the quinoa and heavy on the other stuff;) If you’ve been to a Peruvian restaurant, you know that quinoa can be divine. But after a few attempts, I gave up on it because I couldn’t reproduce the texture and flavors of the restaurants. I got mush, or hard granules. And those little tails on each grain creep me out. What to do with the hefty bags of quinoa we stocked up on in our initial enthusiasm? Turns out, it makes fantastic food for the birds! Who’s Scott?? 🙂 I’ve never been to a Peruvian restaurant (nor to Peru). But there are a couple in town I guess I should try. I like the bird food idea, though. Sorry! Somehow I thought that was your name. I need coffee. Quinoa and pumpkin always go well together. Ha! Well I’m definitely laughing! You eating — and enjoying! — quinoa is a feat I didn’t think I’d see around these parts. But in all seriousness, red or white? I just bought some red and I don’t think I like it as much. But maybe it was just the application. Oh god. I need a beer. hahaha! I bought (brace yourself) a 5# bag of red quinoa last week. Guess I’ll be choking it down for a while! Holy moly! I bought a 6 oz. bag with no clue how I’d ever get through it. This sounds like an application I could get behind! So “it wasn’t bad,” huh? That’s not the same as delicious. I love the idea of this recipe – I’m a huge fan of yogurt cucumber salad. I make mine with lots of dill.